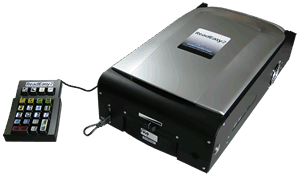 ReadEasy2 is the direct replacement to the best selling ReadEasy desktop scanner reading machine. ReadEast2 lets you read anything printed within seconds by simply placing it onto its scanner and pressing one button! Ease of Use: ReadEasy2 is incredibly simple to operate. Insert your document, press one button and within seconds it is being read out loud to you. High speed scanning: ReadEasy2 takes an average of just 15 seconds to scan and begin reading a document to you. Twice as fast as book-edge scanning solutions: Due to ReadEasy2's specially selected high power scanner, it scans deep into the spines of books, meaning there is no need for more expensive book-edge solutions saving you both time and money. Tactile Keypad overlay: If users only require standard functionality, simply fit the included keypad overlay and reduce the number of buttons to just four. Four high quality voices as standard: Each ReadEasy2 (UK and US version) comes with four high quality natural sounding voices. Store your documents: ReadEasy2 is capable of storing over half a million documents that you can retrieve from its memory at any time. CD playing and burning: ReadEasy2 allows the playing of any audio CD format including Daisy and MP3 CDs. Documents can also be saved directly to CD in either MP3 or standard CD audio format allowing you to listen to them on any standard CD player. Import and Export your documents: Import text documents to read aloud and export your scanned documents to either the included CD or MP3 player. ReadEasy2 is an ideal reading device for anyone who struggles to read with a standard video magnifier system. It's crystal clear speech means you can listen to anything printed with ease: books, bills, newspapers, magazines - all by simply pressing one button. It also works very well in institutions such as libraries as an accessible access point.